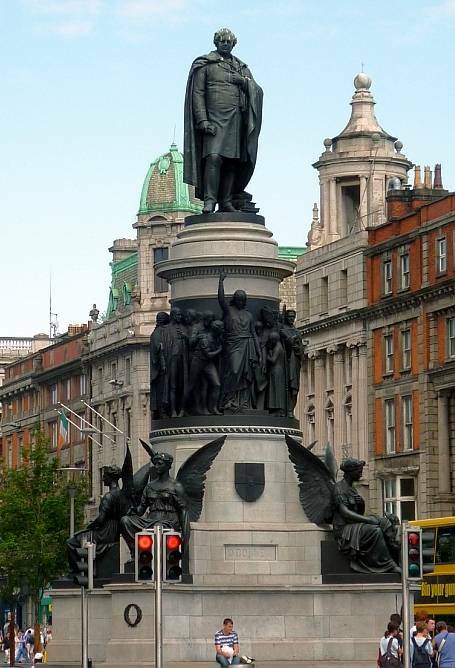 The O'Connell Monument, by John Henry Foley (1818-1874), R. A.
John Henry Foley (1818-74), R. A. The process of raising this celebrated monument to the Irish leader Daniel O'Connell took over twenty years in all. O'Connell died in 1847, a subscription was started for his monument in 1862 "when O'Connell was still remembered primarily as the successful liberator of Catholic Ireland" (McBride 30), and the granite foundation stone for it was laid in 1864. Foley was then engaged on the project for the rest of his life, and, sadly, did not live to complete it — although only finishing touches (the statue's boots, some parts of the clothing on the frieze, and the bodies of the four winged Victories round the plinth) remained to be done (see Read 72-5). This was one of several important works-in-process to be finished by his assistant Thomas Brock. Benedict Read comments that completing such monumental projects must have stood Brock "in good stead in his subsequent career" (75). Above the splendidly winged Victories (representing Patriotism, Courage, Eloquence and Fidelity) and below the figure of O'Connell himself is an impressive circular frieze crowded with over thirty figures. In the front centre, the "Maid of Erin" (representing Ireland) points up at O'Connell, the liberator. The other figures include a bishop with his crosier, a workman with (perhaps) his hoe, a bewigged lawyer and so on, together representing all the elements of Irish society. Since the Victories are partly obscured by traffic lights, and the crowning figure of O'Connell shows the usual effects of exposure to bird-life, this frieze is perhaps is the most striking part of the monument. "It is not a novel design," writes Christine Casey, of the monument as a whole, but "it is a work of considerable gravitas and virtuosity"; she describes it as "the high point of public sculpture in Dublin" (61). Casey, Christine. The Buildings of Ireland: Dublin (The City within the Grand and Royal Canals and the Circular Road, with the Phoenix Park). New Haven & London: Yale University Press, 2005. McBride, Ian. History and Memory in Modern Ireland. Cambridge: Cambridge University Press, 2001.